With a name like that, these guys are certainly taking no chances in ensuring that this release reaches their desired market. 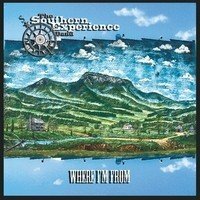 ‘Where I’m From’ is the debut full-length from this North Carolina foursome, and certainly is a hugely enjoyable ‘southern experience’ with ten well-crafted observations on life in the south. It’s the title-track that opens the album, and there’s a distinct vintage Lynyrd Skynyrd feel to it, both musically and lyrically. But from thereon in it’s not all about aping the Southern Gods, as TSEB incorporate many more elements into their music, while still staying true to their roots. For instance ‘Make Me Or Break Me’ has more of a Westcoast edge, with Scott Sanders clear melodic voice to the fore, while accompanied by some acutely Eagles-like harmonies, and ‘Could Be Better’ has a definite Latina vibe, and is replete with a guitar solo from J.T. Fitch that would earn a nod of respect from Carlos Santana himself. Elsewhere ‘You Know’ is a searing Blues-Rock shuffle, ‘Take It Slow’ is an emotionally charged Blues ballad, ‘Red Riding Hood’ incorporates a funky blues groove, ‘You And Me’ is a Country-tinged ballad, and ‘Rockin’ It Out’ lives up to its name with some hearty Rock’n’Roll. The album also includes the second cover version of Stevie Wonder’s ‘Superstition’ I have reviewed this issue, and while the other is a complete abomination, this one stays true to the original and is a worthy addition to the rest of the material. Top billing however must go the wonderfully rootsy ballad ‘Fight The Fight’ with its anti-war message, that again leans towards Lynyrd Skynyrd in their prime. As Lynyrd Skynyrd are releasing their own latest opus this issue, it’s true to say that their ‘Last Of A Dyin’ Breed’ will garner the most interest for the Southern Rock genre, due to their legendary status. But that should definitely not overshadow this little gem, as this too should find a place in the collection of any true Southern fan.